The plans for Factory, the brand new flagship cultural venue for the North designed by world-leading architects Office for Metropolitan Architecture (OMA), have been granted planning approval by Manchester City Council today. The unique venue will be at the heart of the vibrant new creative-led St. John's neighbourhood, which is being developed by Allied London, in partnership with the council, on the site of the former Granada TV studios. Factory will accelerate economic growth in the region. Its economic impact will be considerable - creating or supporting almost 1,500 full-time jobs and adding £1.1 billion to the city’s economy over a decade. It will make a direct contribution to the growth of creative industries in the North, and reduce the dependency on London as the provider of creative industries training and employment. It will also develop partnerships with the city’s leading higher education institutions and will further support the city’s drive for high calibre graduate talent retention through job creation. HM Treasury has this week approved the full business case for the £78m government capital investment in the project. The new venue will offer audiences the opportunity to enjoy year round, in a new world-class facility, the broadest range of art forms and cultural experiences - including dance, theatre, music, opera, visual arts, spoken word, popular culture and innovative contemporary work incorporating multiple media and technologies. Artists from across the world will be invited to create new work in the building’s extraordinary spaces. 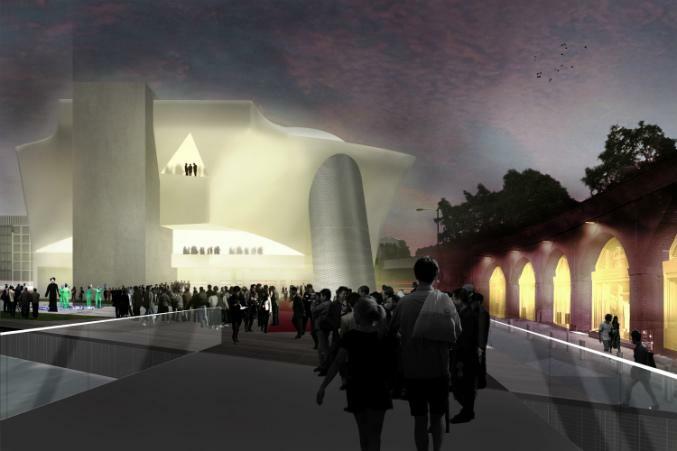 The ultra-flexible space will bring a world-class arts programme to audiences of up to 7,000 at a time. It will welcome around 900,000 visitors a year and is expected to attract around 200,000 visitors a year from outside Greater Manchester. It has been confirmed that Manchester International Festival (MIF) will operate Factory as well as continuing to deliver the festival every two years. Mark Ball, currently Artistic Director of LIFT, will join MIF's senior leadership team as Associate Artistic Director, focusing on creation and delivery of the Factory programme. He will start full time at MIF in June, working closely with Artistic Director/CEO John McGrath to create a unified artistic vision for the venue and the festival. Construction on the ground-breaking new venue is due to begin in Spring 2017. The project is OMA’s first major public building in the UK and is led by project partners Ellen van Loon and Rem Koolhaas, founder of OMA. OMA lead a multi-disciplinary design team including Buro Happold Structures and MEP, Arup Acoustics, Gardiner and Theobald as cost consultants and Deloitte as planning consultants. Development of the unique venue is being driven by the extraordinary creative vision and breadth of Manchester’s cultural life. Sir Richard Leese, Leader of Manchester City Council, said: "Factory is what the arts world and Manchester has been waiting for. It's the key to unlocking a wealth of new cultural opportunities in the city for audiences and arts practitioners, and also to massive economic gain for Manchester and the wider region. Factory isn't going to just transform this unused corner of the city centre, it's going to further transform the way we see the world, and the way the world sees Manchester." Ellen van Loon, OMA partner in charge of the project, said: “From classical opera and ballet to large scale performances and experimental productions, Factory in Manchester provides the perfect opportunity to create the ultimate versatile space in which art, theatre and music come together: a platform for a new cultural scene."